As the battle lines are drawn between the two competing Bitcoin Cash implementations, what wider understanding can the crypto community gain about Nakamoto consensus? Nakamoto consensus is one of the major differentiating factors between traditional and crypto asset classes. As we embark on the start of the first major hash war in the industry, how will Nakamoto consensus play out in this epic battle for the “Real Bitcoin” crown? Bitcoin grew up and was built on the decentralised principles that were put in place between the economic game theory that played out between its participants. Those participants make up five key groups: developers, miners, nodes, exchanges and users/merchants. In the current fork war between the ABC and SV protocols, we are seeing groups of miners, developers and nodes picking sides in what may become an epic battle for consensus. The ABC chain is currently around 50 blocks ahead of the SV chain. There was prior speculation, but at this stage we have not witnessed possible re-org attacks happening. Since the start of the fork, we have seen the ABC chain significantly ramp up its hash power by a factor of 12x (from 0.6 exahashes/second to 8.2). 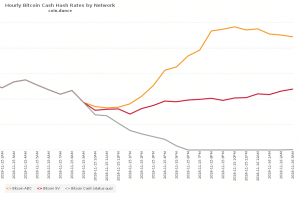 We have also seen SV hash power increase 1.4x (from 2.4 exahashes/second to 3.9). In percentage move, this is a complete flip in hash power from the 70% vs 20% lead that SV had going into the fork. Using data from Nicehash we can calculate the approximate cost to rent sha256 hash rate on the network at around $8,100 an hour to rent each exahash of hashpower. That means at the currently traded price of Bitcoin SV and ABC respectively ($105 and $283) and the current amount of each coin expected to be mined at six blocks an hour. We can say that it will lose the miners approximately $1.5 million a day to keep the ABC chain alive or the SV miners $0.5 million a day. Another caveat to all this is that according to data from fork.lol the miners pointing their hash rate towards either ABC or SV are losing a profitability multiple of 2.32x to NOT mine the BTC chain. During yesterday’s fork we saw a couple of different live streams. We saw Tone Vays host a live stream with mostly Bitcoin maximalists, this also included people like Charlie Lee and ‘fluffy pony’. Roger Ver was also on a competing Bitcoin.com live stream that included Vitalik Buterin making an appearance. The only appearance of the night for Craig S Wright was on the hashwar.live. In Dr Wright’s appearance, he went on a long hour plus rant on various topics. In summary, he maintained an attack-minded stance towards the ABC project. Some notable quotes included “It’s about how much hash can you sustain, a month from now they won’t be able to afford to pay their bills!”. A month from now the opportunity cost to ABC could be over $45 million. We will be keeping a close eye on respective hash power – how many blocks ahead each project is and exchange price for each side of the fork. The only major news that could come is if we saw a re-org attack, but each side would be wary about doing this as it could degrade any long-term trust in the projects. The fact that we haven’t seen one yet suggested it won’t be used. For most, we should watch and learn as Nakamoto consensus plays out between a group of, some might say, irrational actors – but with very real money at stake.